The ‘International Tourism Mart’ gets underway in Agartala, the capital city of Tripura on Thursday. 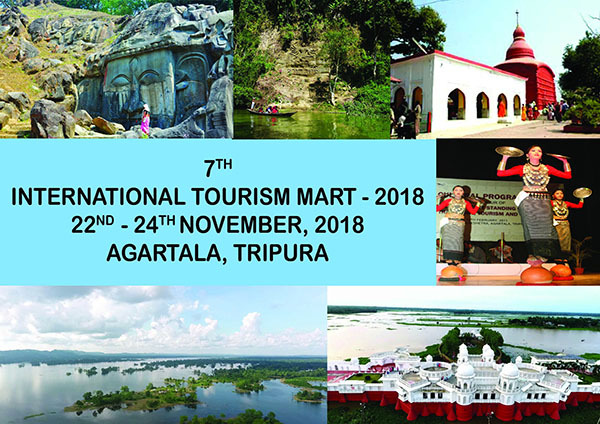 The tourism mart organized by the Union Ministry of Tourism in association with the Department of Tourism of Tripura and other north-eastern states will conclude on Saturday. This is the seventh edition of the International Tourism Mart, an annual event organized in the north-eastern region with the objective of highlighting the tourism potential of the region in the domestic and international markets. The event has been planned and scheduled to facilitate interaction between buyers, sellers, media, government agencies and other stakeholders. The tourism mart is expected to witness wide participation of international buyers and media delegates from countries around the world and from different regions of the country. They will be engaging in business-to-business meetings with sellers from the north-eastern region which will enable the tourism product suppliers from the region to reach out to international and domestic buyers. A total of 41 foreign delegates from 18 countries and 23 tour operators and travel agents along with 18 media representatives, journalists, travel writers and bloggers are participating in this edition of the tourism mart. Besides the foreign delegates, 26 domestic tour operators from other parts of the country and 78 sellers from the north-eastern states are participating in the tourism mart. The earlier editions of the tourism mart were held in Guwahati, Tawang, Shillong, Gangtok and Imphal.